When I’m traveling, I like to get lost. I know that’s not for everyone, but I really think you learn so much more about new surroundings when you have no idea where you are or how to get where you’re going. If you know precisely how to get from point A to point B, then those are the only 2 points you’ll see on an excursion. However, if you’re completely clueless about the “correct” route, then you’re bound to take “wrong” turns – which could lead to stumbling upon new-to-you discoveries at point C, taking in local culture when you stop to ask for directions at point D, and making new friends at the bar conveniently located at point E where you finally stop for a glass of rum once you’ve given up looking for point B altogether! What I’m trying to say is, for me at least, getting to point B is just an excuse. The real goal of an excursion when traveling? Surprises. Such was the case recently, while driving on Grenada. (In fact, this happened on the same ill-prepared for excursion I’ve written about before.) So, point A was the excellent Mount Cinnamon Hotel at Grand Anse in the south of the island and point B was the little village of Gouyave on the west coast. I figured if I kept the water on my left and kept driving, I’d make it… Eventually. Unfortunately Fortunately, I was lost before I even left St. Georges! The problem was, I needed to get across a large hill on the west side of town to keep going, but every time I tried to drive over it, the road would turn back into the heart of St. Georges putting me right back where I started. I did this twice, before I stopped at point D: where you ask for directions. I did as I was told under his watchful gaze and almost immediately found myself looking at the image you see above: the southeast entrance of the Sendall Tunnel. I promptly stopped the car. What you need to understand is this tunnel is small. Commissioned by the Sir Walter Sendall governor’s administration and completed back in 1894 this tunnel was made for horse drawn carriages to squeeze from the center of town without having to crest the steep hill. Just looking at it today, it’s not 100% clear as to who should still be using it. Is it just for pedestrians? Is it for cars? Can it accommodate two-way traffic? All these questions percolated in my mind as the engine of my little island rental idled at the entrance. At that time, it occurred to me that this little tunnel on Grenada was older than the Brooklyn Bridge. In fact, this Grenadian feet of engineering opened the same year as the Eiffel Tower! Now that’s a trustworthy example of late 19th century engineering… But I wonder, how many other “engineering feats” of 1894 have also survived the ravages of time? 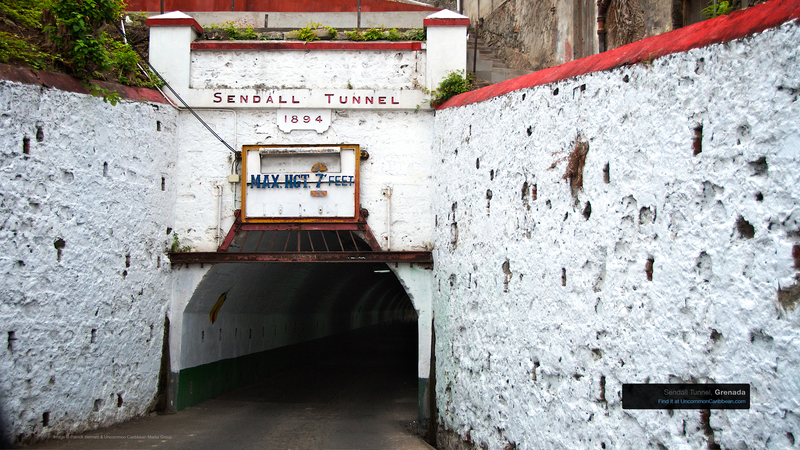 And as people have been doing on the island of Grenada for nearly 120 years, I drove the 350 foot length of the Sendall Tunnel – abruptly dodging pedestrians and straining to keep from scraping the rental against the narrow walls. If you find yourself on The Spice Island and do the same, your reward will be finding yourself at Market Square and the Minor Spices Society where nutmeg, cinnamon, cloves, pimento, saffron and other spices are sold. Of course, you could just reward yourself today by downloading this week’s Caribbean Wallpaper. I’ve heard the internet is a serious of tubes, so it’s almost the same thing, right? Last updated by Patrick Bennett on 01/02/2014 .